Renault has released pictures of its refreshed Megane hatchback that promises a more modern look and three new stop/start engines. A number of small styling changes have been made including a new LED lighting design at front and rear, new wheels and a gloss black front bumper with chrome highlights. Inside, the cabin gets new interior trims, including a two-tone leather pack available in a choice of two finishes. The GT-Line has also been enhanced inside with specific ‘boomerang’-shaped LED lights, red upholstery stitching and a sports steering wheel incorporating thumb rests, plus Renault Sport-badged door sill guards and dashboard trim strip. The list of body colours has been extended with Azzurro Blue and Arctic White. The three new stop/start engines comprise the dCi 110, dCi 130 and the brand new TCe 115. The latter is the most powerful 1.2-litre petrol engine in the world, but retuns 53.3mpg and only 119g of CO2/km. It gives it theoretical range of about 620 miles. The TCe 115 is the first Renault petrol engine to feature direct fuel injection and turbocharging. It will replace the 1.6 16-valve and boasts both extra power (up 5hp to 115hp) and peak torque up 40Nm to 190Nm, with 90% available from 1,650rpm. In addition fuel consumption is down 25%. The range will also be available with two diesel engines. The new diesel dCi 110 is the Mégane range’s best-selling 1.5 dCi engine but this revised version gets stop/start technology first introduced in 2011 on the 1.6 dCi 130. Fuel consumption has been improved by 15% to 80.7mpg and with CO2 emissions at 90g/km you'll pay no tax for the first year or thereafter. Peak torque is up 20Nm to 260Nm available from 1,750rpm. The dCi 130 1.6-litre diesel engine delivers 130bhp and 320Nm of torque. It returns 70.6mpg, which is a 20% saving over the former 1.9 dCi 130 engine. CO2 emissions stand at 104g/km. 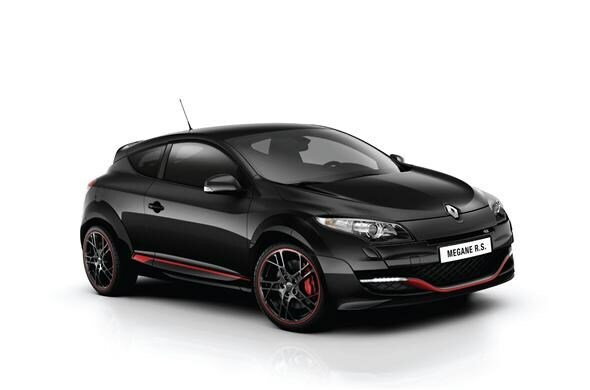 The more powerful Megane Renaultsport 265 (pictured) delivers 15bhp more horsepower and 20Nm additional torque. By selecting the Sport Mode, the driver can benefit from peak power of 265hp and up to 360Nm of torque. In terms of looks, the front end F1-style front blade features two rows of six LEDs and the headlights sport black surrounds. The centre of the new 18-inch alloy wheels, as well as the 19-inch wheels, feature an ‘R.S.’ logo, and a new option is the Renaultsport Red Design Pack which comprises red striping for the front blade, side sills and diffuser. A new interior trim has been introduced, featuring red stitching for the steering wheel, dashboard trim, gearlever knob and surround. The new two-tone light grey and charcoal leather upholstery can also be specified as an option, as can fabric or leather Recaro seats and a predominantly yellow ambience. Other sporty details include a black lacquer finish for the centre console and air vent surrounds, plus a charcoal-effect finish for the door panel inserts. The revised car will go on sale in the UK in April and although prices have not been revealed they are expected to be similar to the current model.